Q: What is the name of the opera they attend in Austria? Q: Is the "gun barrel" in the film? Q: Who sings the opening song? 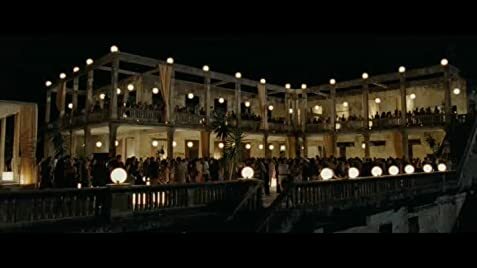 Incomprehensible at times and Utterly Charmless, the Best one can hope for is that James Bond (Daniel Craig) has put His Feelings to Rest, has Forgiven Vesper, and can now get Right with the World of Espionage and Become the Secret Agent that He was Meant to be. It manages to Clear the Air for the Brooding Bond and that may be the Only Thing that is Clear in this Dismal Movie that has so Little of the Bond Feel that it cannot be Forgiven. The Action Scenes are more of the Post Modern, Quick Cut, Shaky Cam Nonsense that Works quite well in Very Limited Doses but is used here to Nauseating Excess that Hacks and Film School Students, and B-Movie makers have Adapted for a "Style" that has been so Overdone as to be Ridiculous. Add to that some Extreme Close Ups and all Sense of What Goes On is Lost in a Placebo of Adrenaline. The Film's Locations are Anything but Exotic, more like Third World Infomercials that are Used to Adopt a Hungry Child. This is a Rather Boring Bond and is about as Unexciting as a Bond could be. Given the Backstory and the Historical Template and Oodles of Money it has just Enough Empathy from Fans to Tolerate this Dull Delivery, but just Barely. The Title is one of the Worst for a Bond Film, as is the Opening Trademark Song, and Overall One gets the Feeling that They are in Disdain for the Character's Attributes and the Coolness that made Bond Survive over 20 Movies, 5 Actors, and 5 Decades. Its Acceptable to Modernize a Bit, Tweak a Little, and bring a Slightly New Artistic Touch, but not at the Expense of the Root Material.